Coding experts point to Ruby as one of the best languages to start with when you're learning coding. It's been a popular choice for schools and code camps who want to introduce coding to a younger audience. Ruby For Kids For Dummies helps teach the basics of coding and Ruby to kids who don't have the opportunity to take coding classes at school or in camp as well as those who simply prefer to learn on their own. 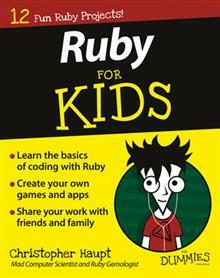 Broken down into smaller, goal-oriented projects, Ruby For Kids For Dummies introduces core coding concepts as it walks the student through steps for creating applications. The book is ideal for early-to-pre-teen learners interested in expanding their technology skills as well as younger readers eager to learn via step-by-step instruction. Christopher Haupt is a computer scientist, game designer, and startup advisor who loves teaching and mentoring kids. Active in his regional school district and community, he supports STEM programs, science fairs, and other opportunities for kids to creatively explore technology.